Taste test: These are great chips. 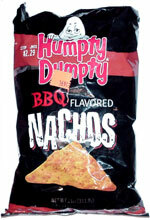 It's unusual to find anyone selling barbecue flavored nachos, and Humpty Dumpty really scored big with this recipe. 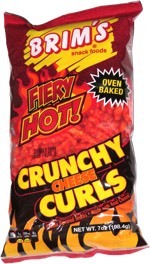 They're got a teriffic, tasty barbecue flavor that's just flavorful enough, without overdoing it  just an all-around great chip. Smell test: Nice aroma, but it's hard to describe. Not really barbecuey, but not really cheesy either.